Nockalm Quintett Unquestionably one of the leading volkst?mliche musik acts of their era, the Nockalm Quintett is an Austrian schlagerband with a long list of hits and accolades to their credit, as well as dozens of albums. The band was active during much of the 1980s, releasing albums regularly, but they didn't score any significant hits until 1987, when "Drei Finger aufs Herz" and "Gib Mir als Souvenir ein Kleines Bild von Dir" established them as a rising act amid the Austrian volkst?mliche musik scene. Two years later, their song "Spiel Nie mit dem Feuer" won the televised ZDF-Superhitparade and made its accompanying album, Liebe, Tr?ume und Musik (1989), far and away the band's most popular to date. From this point forward, the Nockalm Quintett was among the most successful volkst?mliche musik acts of the time, if not of all time. In the wake of "Spiel Nie mit dem Feuer," the Nockalm Quintett enjoyed an uninterrupted series of hits, the greatest of which are "Aus Tr?nen Wird ein Schmetterling" (1990), "Schuld Sind Deine Himmelblauen Augen" (1991), "Und in der Nacht, Da Brauch I Di zum Tr?umen" (1992), "Nur a Tanz und Dann a Busserl" (1993), "Schwarzer Sand von Santa Cruz" (1993), "Und ?ber Rhodos K??' Ich Dich" (1994), "Wir Greifen Nach den Sternen" (1996; featuring Andrea J?rgens), "My Love" (1999; featuring Monika Martin), "Sag Nochmal, Ich Liebe Dich" (2000), "Dort auf Wolke 7" (2002; winner of the Grand Prix der Volksmusik), "Die Kleine Insel Z?rtlichkeit" (2003), "Halleluja Day" (2003), "Amadeus in Love" (2005), "Einsam Wie Napoleon" (2006), and "Volle Kanne Sehnsucht" (2007). 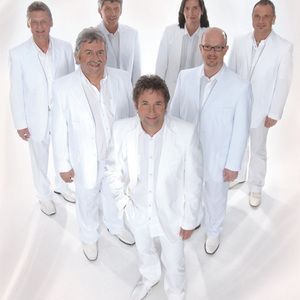 Formed in 1982 in Millstatt, K?rnten, Austria, and named after Die Nockberge (a local mountain range and national park also known as Die Gurktaler Alpen), the band is comprised of Gottfried W?rcher (vocals; born October 24, 1958, in Untertweng), Wilfried Wiederschwinger (bass guitar, saxophone, vocals; July 29, 1958; Bad Kleinkirchheim), Edmund Wallensteiner (bass guitar, guitar, vocals; June 9, 1962; Lienz), Dietmar Zwischenberger (drums, trumpet; July 22, 1962; Fragant), Arnd Herr?der (keyboards; born September 9, 1972; Giessen, Germany), Markus Holzer (guitar; July 14, 1972; Klagenfurt), and Siegfried Willmann (drums, vocals; February 12, 1969; Graz). The Nockalm Quintett released several albums during the mid- to late '80s -- Mit Polkaschwung und Walzerklang, Rund um Bad Kleinkirchheim, Musik f?r Alle, Quer Durch's Alpenland, Drei Finger aufs Herz , F?nf Gute Freunde, Mein Herz Sagt Ja... (the exact release dates for which are unclear) -- billing themselves at the time as the Orig. Nackalm Quintett. The band grew in popularity over the course of the decade, scoring their first major hits with "Drei Finger aufs Herz" and "Gib Mir als Souvenir ein Kleines Bild von Dir" in 1987. The Nockalm Quintett's growing popularity culminated with Liebe, Tr?ume und Musik in 1989. The album spawned a pair of popular singles, "Wann Kommst Du Wieder" and "Spiel Nie mit dem Feuer," the latter of which won the televised ZDF-Superhitparade. The band's follow-up, Aus Tr?nen Wird ein Schmetterling (1990), benefited from the televised promotion, selling enough units to earn the recognition of platinum sales status. The mounting success of the Nockalm Quintett continued when the title track from their next album, Schuld Sind Deine Himmelblauen Augen (1991), competed for the Grand Prix der Volksmusik. A Christmas album, Von Weihnacht zu Weihnacht (1991), was released at the end of the year to capitalize on the band's exceptional popularity. Following two more albums that proved popular, Der Sommerwind Will Keine Tr?nen Seh'n (1992) and Schwarzer Sand von Santa Cruz (1993), charting at number 18 and 24 respectively on the Austrian albums chart, the Nockalm Quintett released Nockalm Gold (1993), an 18-track greatest-hits collection that charted for an impressive 40 weeks, eventually reached number one in 1994, and ultimately reached three-times plantinum sales status in 1995. Nockalm Gold's chart-topping accomplishment marked the first time a volkst?mliche musik act had ever reached number one on the albums chart in Austria. An accompanying greatest-hits video collection of the same name was released as well in 1993. The Nockalm Quintett's popularity continued in the years that followed. Their subsequent albums Und ?ber Rhodos K??' Ich Dich (1994), Sternenhimmelgef?hl (1995), Z?rtliche Gef?hle (1996), and Das Wunder von Pir?us (1997) each sold well, respectively charting at numbers two, five, eight, and three and prompting a follow-up greatest-hits collection to Nockalm Gold, naturally titled Nockalm Platin (1997). In addition to newly compiled greatest-hits collections every few years -- Die Sch?nsten Schlager-Klassiker: Highlights of Love (2000), Rose der Nacht (2001), 20 Jahre auf Wolke 7 (2002), Wir Greifen Nach den Sternen (2005) -- and occasional holiday releases such as Weihnachten mit dem Nockalm Quintett (2000) and Nockalm Weihnacht (2003), the band released albums of new material annually.